Bilpojken, Car-Boy, is a character from the sharp pen of Max Andersson. I have been a fan of Max Anderssons dark universe for years and I've read loads of his comics and seen several of his films. Bilpojken, Car-Boy; is an ordinary boy who lives with his parents, the only unusual thing about him as that his head is shaped like an old car. On the other hand o is his friends heads, Tractor Girl and Wreck Boy. 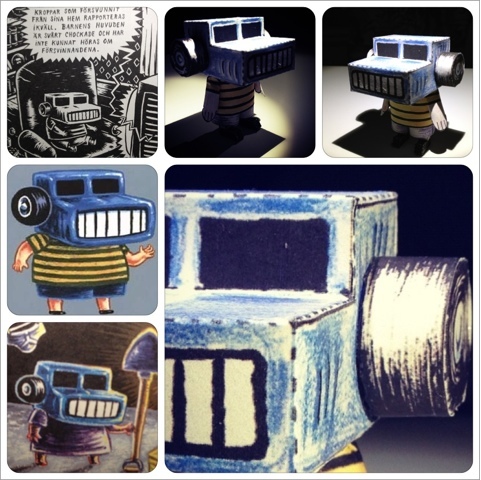 Bilpojken, Car-Boy, the comic and the papertoy. I have permission from Max Andersson to use his character for non-commercial use so feel free to grab a free toy! While you build it have a looksie on Max Anderssons film Spikbebis (Nailbaby). All downloads on this page are free, but a donation to my future work is appreciated. © Stellan Erikzén Hermond.. Awesome Inc. theme. Powered by Blogger.